I had a belated Oktoberfest this year, since I didn’t actually realize that September was long gone until it was almost November. I decided the best way to remedy missing out on those lederhosen-friendly festivities was to have an entire weekend packed full of German and Austrian food, and of course, plenty of heavy drinking. I made two of my favorite traditional Oktoberfest foods: goulash (gulasch suppe), a hearty meat stew with a paprika base, which is hefty enough to be a meal in itsself; and semmel knödel, large bread dumplings that are great for sopping up the soup. My choices obviously aren’t limited to German fare; goulash is originally a Hungarian dish and the knödel hails from Austria. It’s a great meal to make throughout fall and winter, and definitely qualifies as one of my all time favorite comfort foods. 1. Heat oil in a medium sized pot and add the onion and sauté for 2-3 minutes. Add steak cubes and cook another 4-5 minutes, or until meat begins to brown. 2. Add the paprika and caraway seeds, stirring for another minute. 3. All remaining ingredients are now ready to go in, including the potatoes. Stir well and bring to a boil. Let simmer for 30 minutes with the lid on, stirring occasionally. 4. Remove lid and let simmer for another 15-20 minutes, letting the stew reduce and become thicker. *The recipe I use for goulash is based on a package mix, though while not necessary in making the soup, gives me consistent results and tastes just like my family’s version. You can find it online at germandeli.com, or try checking out the import section of your local grocer. *If it calls for liquid, try beer! 1. Cut the buns/bread into small cubs and place in a large bowl. Pour the warmed milk over the bread, distributing evenly. Cover and let stand about 10 minutes. 2. Add butter to skillet and sauté the chopped onion for about five minutes, or until softened. 3. Add the parsley and cook an additional 2 minutes. 4. Pour the mixture into the bowl of bread, then add eggs. 5. Mix all ingredients well with hands until it starts to take on a smooth consistency. 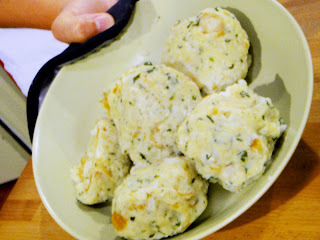 Make a test dumpling by forming the mixture into a ball about the size of a baseball. If it seems too wet, throw in a few bread crumbs. Make sure to mix thoroughly before deciding the mix is too dry. 6. Add dumplings to boiling salt water. They will start to float near the top when they are about halfway done. I usually take out the test dumpling first, cutting it in half to get an idea of how long they need to cook. If it’s underdone, throw it back in. 7. 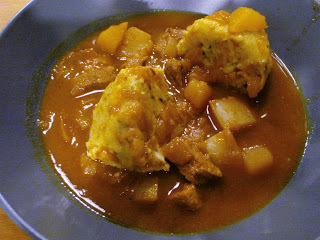 Top with goulash and serve. *First, the bread is pretty important, so make sure you use a hearty white bread, like a deli style sandwich roll or French bread. In this recipe I used a loaf of sourdough and let it sit past its prime, about a week, so that it was dry and stale. (Make sure you store it in a cool dry place so it doesn’t mold.) This allows the bread to absorb the milk and eggs, giving it the body and consistency you need for turning that gooey mess into perfect dumplings. *Instead of using two eggs, you might want to try picking up some egg whites (from the carton, such as Organic Valley). Try adding one egg and then use egg whites so you have more control over the moisture. Beverage Recommendation: Aside from the standard Oktoberfest beer selection, there are plenty of delicious wines from Germany and Austria. Try a Grüner Veltliner, an increasingly popular Austrian white wine that is often served in a mug. Similar to a chardonnay, it’s a versatile, palate-cleansing wine that pairs well with spicy dishes, and also makes a good match with pork ribs and sauerkraut.